One of my favorite episodes of The Sopranos is during the second season when Tony’s protégé and nephew, Christopher, gets shot by two of his subordinates, the stumbling, bumbling, wannabe gangsters Matthew Bevilaqua and Sean Gismonte. The episode ends with Tony sitting at Christopher’s hospital bedside quietly muttering to himself, “how could this happen?” This attempt at a power play was a huge deal in the fictional mob world because it displayed utter disregard for proprieties in the apparatus of organized crime, where hubris amongst those with little to be proud of is bad for business. In mid-August, a letter to Speaker of the House John Boehner, drafted by North Carolina Congressman Mark Meadows, began circulating around the Congressional office buildings. Elected in November, Meadows – a Tea Party zealot – came to Washington spewing venom for the Affordable Care Act, better known as ObamaCare. “Since most of the citizens we represent believe that ObamaCare should never go into effect,” the letter read, “we urge you to affirmatively de-fund the implementation and enforcement of ObamaCare in any relevant appropriations bill brought to the House floor in the 113th Congress, including any continuing appropriations bill.” After garnering 79 other Tea Party signatories, Meadows and his band of ideological imbeciles started on their crusade. The continuing appropriations bill Meadows was referring to is – in simple terms – a contract to fund the government. This yearly process requires negotiation between members of Congress and the Senate, who upon reaching agreements on appropriations for programs, send the continuing resolution to the President for signature. This year’s continuing appropriations bill included the funding of the Affordable Care Act (ObamaCare). This piece of legislation serves several functions. In addition to requiring private insurance companies to cover 40 million previously uninsured Americans, it expands Medicaid, a government program set up to cover low-income adults who cannot afford to purchase health insurance. The Affordable Care Act was set to go into affect on October 1st, the same time as a new continuing appropriations bill to fund the government. For the Tea Party caucus to be successful in their endeavor to defund the ObamaCare, the Democratically controlled Senate and Democratic President would have to sign off on the continuing appropriations bill. This is the same Affordable Care Act that President Obama campaigned on in his latest election victory, and was deemed constitutional by the United States Supreme Court. The Tea Party caucus’s plan was not just unreasonable; it was impossible. With the reluctant blessing of Speaker of the House John Boehner, the Tea Party effectively took the U.S. government hostage, playing a game of chicken to get President Obama to swerve out of the way first. 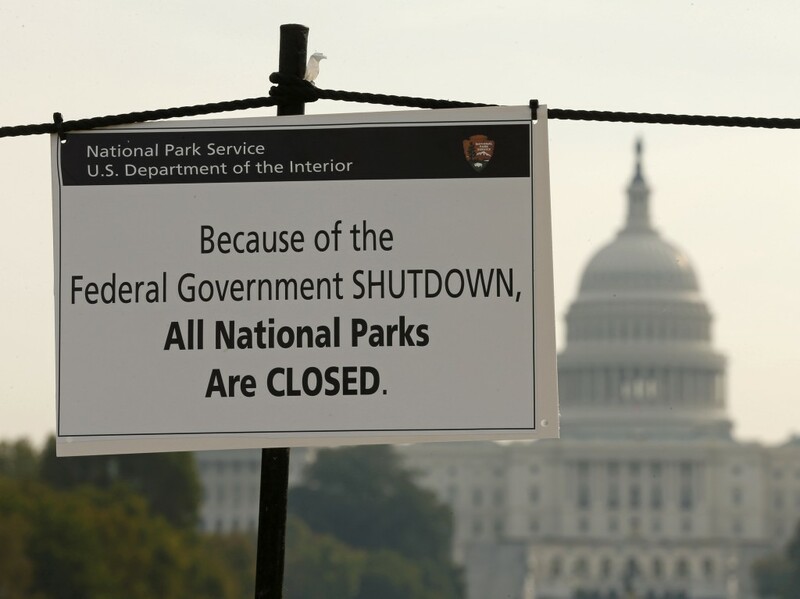 With both the Republican controlled Congress and Democratic controlled Senate refusing to back down, on October 1st, the U.S. government was shut down, furloughing 800,000 “non-essential” government employees, while asking nearly 1 million more to work without pay. According to the New York Times, these “non-essential” employees included much of the Food and Drug Administration, which suspended routine establishment inspections and monitoring of imported foods and drugs. In addition to the FDA, the Center for Disease Control furloughed 68% of its employees, while the Environmental Protection Agency was nearly shuttered after 94% of their employees were told not to come to work. It seems some of the only government employees permitted to go to work were members of Congress and the senate. People like Mark Meadows. Seeing poll numbers largely blaming the Republicans for the shutdown, and with default looming, Republicans swerved first, and conceded defeat to the Democrats. The Affordable Care Act was not defunded, and the debt ceiling was raised. After a 16 day shutdown, the furloughed government employees were permitted to go back to work. It would be foolish to consider this a victory. According to the rating house Standard & Poor’s, the government shutdown cost the U.S. economy $24 billion in lost revenue. This has been an ugly year for the U.S. With revelations regarding the use of drones and spying scandals, Americans have overlooked what could be the real threat to national security: the Tea Party. According to an article in The New Yorker those 80 politicians who signed onto Meadows’ letter to defund the Affordable Care Act represent just 12% of the 118 million votes cast in House elections in November. This fringe element of Reagan-wannabes robbed the U.S. economy of $24 billion in lost revenue, while threatening the good faith and credit of the U.S. This anti-intellectual group has declared war against reason and compromise necessary in any political discourse. Harkening back to Tony’s question, I too wonder, how could this happen? Draped in a façade of Stars and Stripes, the Tea Party and the U.S. government which enables them represent the organized crime family of Washington, D.C. Extortionists and con-artists who try to keep people from accessing health insurance and threatening to not pay bills create bad precedent. Tony knew that bad precedent was bad for business. How long until the voters realize the same?